Consistently improving our manufacturing process allows us to meet the ever-changing needs of customers and stay out in front of the competition. Modern equipment gives us the diversified capabilities required to meet close-tolerance specifications. Our equipment includes presses ranging from 5-ton to 45-ton stamping capacity, multiple slides, as well as a wide range of coilers capable of producing spiral and helical coils. Secondary finishing services includes vibratory tumbling, heat treating, painting, spot welding, coating, plating and tapping. Our machine operators are the first line of quality control support. They are exposed to extensive training to keep them abreast of any new technology that will improve our performance. 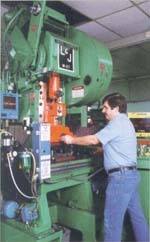 With many years experience in the metals industry, we are able to build the most productive and cost efficient tools.